To wrap up this week of dim sum delicacies, I bring to you... something I've actually never eaten before I made it: Char siu pastries. Yes, this is not something I personally have ever seen at a Chinese restaurant, and to think it has been missing from my life for so long. Thankfully now the void can be filled, as these flaky and delicious pastries were worth every bit of effort to create them. I actually made these to take on a plane ride, and I must tell you, I think everyone else on the flight wanted to fly Victoria Airlines from now on :) I had also made peach-ginger hand pies (recipe coming soon). You can imagine the jealousy. 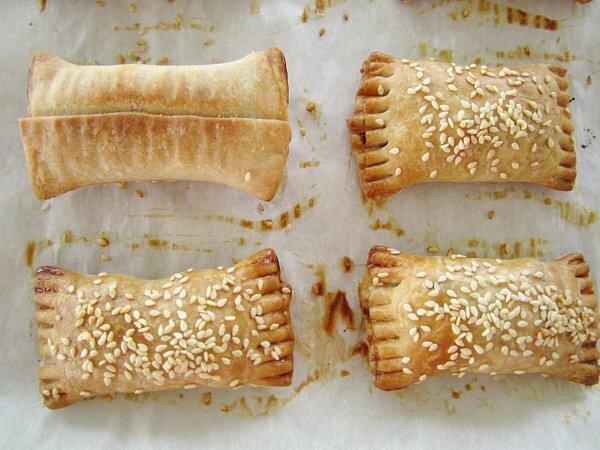 Chinese flaky pastry, or su bing pi, is a laminated dough much like that used for croissants and puff pastry. It was actually a lot easier to make this dough than I have found it to make croissants in the past. Seriously, it is way less temperamental. The recipes I have for the dough use lard or shortening, but I just couldn't bring myself to do it. Yeah, I get it, lard is awesome and flavorful, yada yada yada. Well, you know what? Butter is pretty freaking awesome too! I'm gonna side with Julia Child here and stick with butter. Unsalted, of course. I adapted the dough recipe from Asian Dumplings (which suggests using the dough to make curry puffs as well) and the filling, assembly and baking from Dim Sum: The Art of Chinese Tea Lunch . Why didn't I just stick to the dough recipe in Dim Sum? 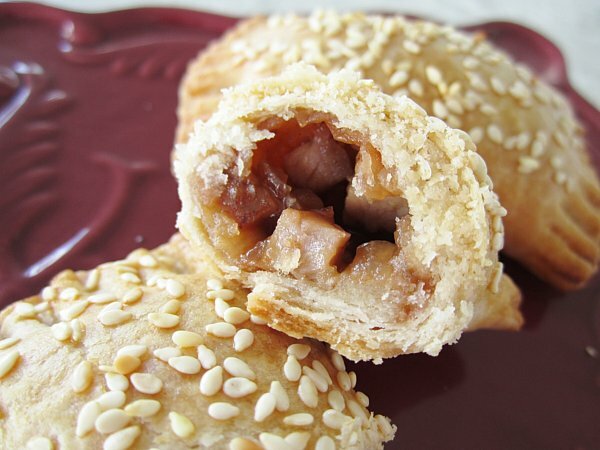 Well, Chinese flaky pastry uses a water dough and short dough to create flaky layers. The water dough in Asian Dumplings used less fat and more water, while the water dough in Dim Sum actually used a lot of fat, so I thought having the two doughs be vastly different in fat content would do a better job in creating the flaky layers I desired (and would also be less fattening... I'm not gonna lie). For those reasons, I decided to use that recipe for the dough, but the rest came from Dim Sum. And for that matter, the filling was incredible! It had more of a sweetness (from Hoisin sauce) than the char siu filling for the baked char siu bao I had previously made. 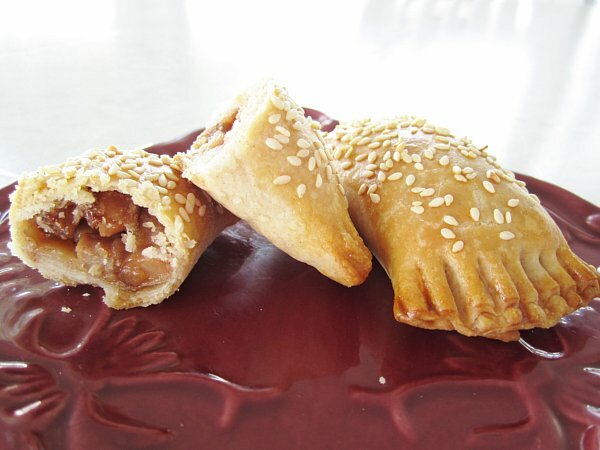 Between the sweet pork filling and the buttery, flaky, and crumbly crust, and the sprinkling of sesame seeds on top, these adorable little packages were an instant favorite! From the very first bite, my dad couldn't stop talking about how much he loved the flavor and texture of the crust, and even suggested other fillings I could use next time. I cut these with a serrated knife which kept it clean but doesn't show the layers of the dough as well. The photos don't even do these pastries justice. Imagine taking a bite, and the crust literally shattering in your mouth. It's not quite like a croissant, it's a lot denser and less ethereal, but it has a lot of flakiness nonetheless. If you look closely you can see each individual layer. I'm sure using lard or shortening would make it even more flaky, but for what its worth, we all LOVED the crust exactly as it was, and I wouldn't change it in the future. I can easily see myself making more of these and freezing them unbaked for cravings as they occur (which I imagine will happen like clockwork). See how the seal is on the bottom? Thank you so much for joining me in my dim sum adventures this week! Don't forget to check out my previous posts to find the recipes for pan-fried vegetable dumplings and scallion pancakes. To make the water dough, combine the flour, sugar, and salt in a food processor and pulse 2 to 3 times. Sprinkle in the pieces of butter and process 10 more seconds until the mixture looks like coarse meal. Alternatively, put ingredients in a mixing bowl and use your fingers in a quick rubbing motion to combine flour and butter. Transfer mixture to a bowl (if you used food processor method), make a well in the center, and work in the water 1 tablespoon at a time. Use a wooden spoon to stir into a ragged mass. Transfer to a lightly floured work surface and gently knead for about 2 minutes to create a soft, smooth, and slightly elastic dough. Pressing your finger in the dough should cause the dough to slowly bounce back, leaving a faint impression. Cover with plastic wrap and set aside at room temperature to rest for 20 to 30 minutes. Meanwhile, make the short dough. Put the flour in the food processor and sprinkle in the butter. Process for 10 minutes to blend and generate a mealy, lumpy, very soft mixture. Transfer to the same bowl as before, and use the wooden spoon to mix and combine well. Alternatively, put the ingredients in the bowl and use your fingers or the back of the wooden spoon to mash together until no flour is visible. It will resemble soft cookie dough. Gather and pat the dough on a lightly floured surface into a 3-by-4-inch rectangle. Set aside. Return the water dough to the lightly floured work surface and roll it out into a 5-by-8 1/2-inch rectangle, with one long edge toward you (like a landscape photo). Place the short dough in the center of the water dough, with one short edge toward you (like a portrait photo). Fold the sides of the water dough over the short dough with the edges overlapping slightly (like enclosing a photo in a letter). Press the overlapping edges and both ends to seal in the short dough completely. Roll out in the direction of the folds to make a rectangle about 6-by-18-inches. Fold the dough into thirds to form a 6-inch square. Cover the dough with plastic wrap and refrigerate for 30 minutes. Unwrap the dough and roll it out again in the same direction to make a 6-by-18-inch rectangle as before. Fold in thirds, wrap, and refrigerate for another 30 minutes. Repeat the rolling and folding processes once more (that's 3 times total). Cover the dough with plastic wrap and refrigerate it at least 30 minutes, and up to 1 day ahead, before the final rolling and shaping. To make the filling, in a small bowl, stir together the water, sugar, hoisin sauce, oyster sauce, soy sauce, and sesame oil, and set aside. Heat a medium skillet over medium heat. Add the oil. When it is almost smoking, add the onion and stir-fry for 3 minutes or until translucent. Stir the flavoring sauce into the onion and heave for 30 seconds or until bubbly. Give the cornstarch mixture a final stir and add to the skillet. Cook for 30 seconds longer, or until the sauce has thickened. Stir in the char siu and remove from the heat. Transfer the filling to a large plate and divide into 12 portions. Cool to room temperature. Roll out the prepared dough into a 13-inch square. Using a ruler, trim off the uneven edges to make a 12-inch square, then cut the dough in thirds crosswise and quarters lengthwise to make 12 (3-by-4-inch) rectangles. 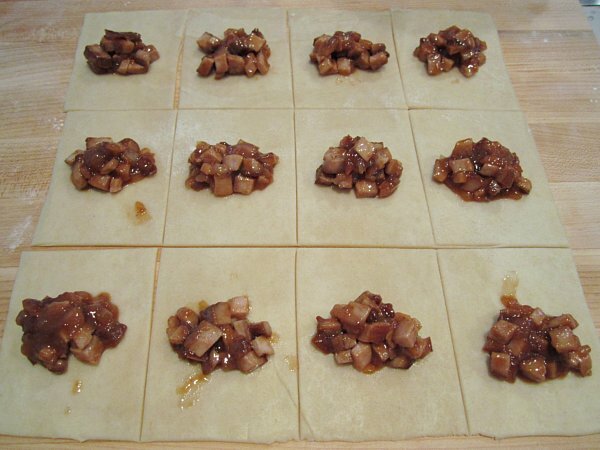 Place one portion of the char siu filling across the center of each rectangle in the 3-inch direction, leaving about 1/2-inch border on either side for sealing. Overlap the dough over the filling (like enclosing a photo in a letter). Press down to seal in the filling on all sides. Flip the pastry over so the seal is on the bottom, and use the tines of a fork to seal the short edges. Place on the baking sheet. Repeat with the remaining dough and filling, spacing pastries 1-inch apart on the baking sheet. At this point, the unbaked pastries may be covered and frozen until firm and then transferred to a zip-top freezer bag. 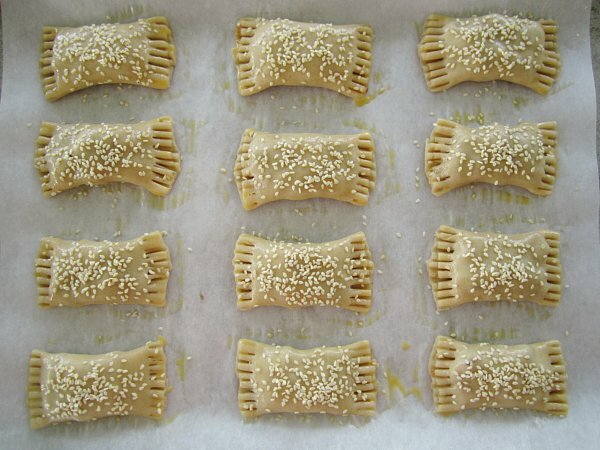 Place frozen pastries on a baking sheet as above and let them thaw 30 minutes before proceeding. 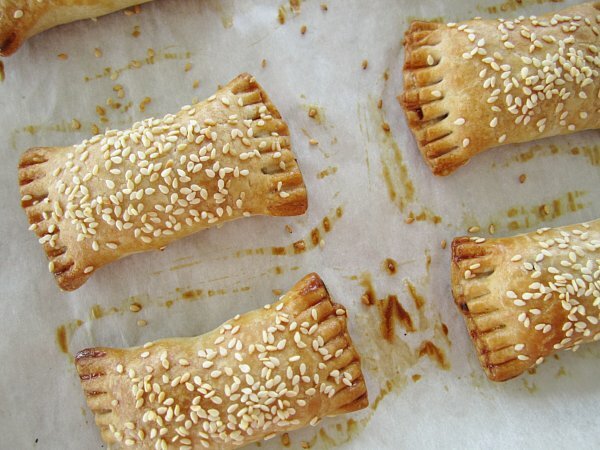 Brush the pastries with the egg wash, then sprinkle them with sesame seeds. Bake for 25 to 30 minutes, or until golden. Cool briefly on a wire rack. These are best served warm, but are also delicious at room temperature.